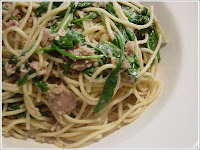 Here's a quick pasta dish that can be made with (mostly) pantry ingredients from another great blog, Simply Recipes. 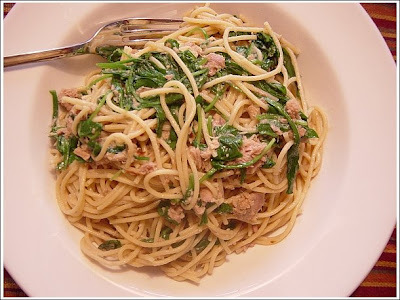 Saute some minced garlic and red pepper flakes in olive oil, add in some tuna and mix with the spaghetti and arugula, a little salt and pepper and you're done. Once the water boils, this one comes together in about 10 minutes with very little prep. I'm not always crazy about arugula because I find its bitterness a bit off putting in certain dishes. I was going to swap in baby spinach, but they did not have any at the grocery store when I went shopping, so I ended up using baby arugula. All was well in the end, as I found the slight bitterness added a nice note to the finished dish. When you buy your tuna in oil, make sure it's packed specifically in olive oil (which is what the recipe calls for), not canola or some other oil. I made this mistake and ended up having to make a stop on my way home for the correct product.